Saint John was born in Damascus about the year 675, the son of wealthy and pious parents, of the family of Mansur. He was reared together with Saint Cosmas (see Oct. 14), who had been adopted by John's father Sergius, a man of high rank in the service of the Caliph of Damascus. Both of these young men were instructed by a certain monk, also named Cosmas, who had been taken captive in Italy by the Arabs and later ransomed by John's Father. Saint John became a great philosopher and enlightener of the age in which he lived, and was honoured by the Caliph with the dignity of counsellor. When Emperor Leo the Isaurian (reigned 717-741) began his war on the holy icons, John wrote epistles defending their veneration. Since the Saint, being under the Caliph of Damascus, was beyond Leo's power, the Iconoclast Emperor had a letter forged in John's handwriting which invited Leo to attack Damascus, saying the city guard was then weak; Leo then sent this letter to the Caliph, who in his fury punished John's supposed treason with the severing of his right hand. The Saint obtained the Caliph's Permission to have his severed hand again, and that night prayed fervently to the most holy Theotokos before her icon. She appeared to him in a dream and healed his hand, which, when he awoke, he found to be healed in truth. This Miracle convinced the Caliph of his innocence, and he restored John to his office as counsellor. The Saint, however, with many pleadings obtained his permission to withdraw from the world to become a monk. He assumed the monastic habit in the Monastery of Saint Sabbas. Then he had as elder a very simple and austere monk who commanded him neither to write to anyone, nor to speak of the worldly knowledge he had acquired, and John faithfully obeyed. A monk grieving over his brother's death, however, after insisting vehemently, prevailed upon John to write a funeral hymn to console him for his brother's death. When John's elder learned of his transgression of the rule he had given him, he cast him out of his cell, and would only accept him back after John had humbly, with much self-condemnation and without murmuring consented to clean all the latrines in the lavra. After his elder had received him back, our Lady appeared to the elder and sternly charged him not to hinder John any longer from his writings and composition of hymns. In his writings he fought courageously against the Iconoclasts Leo the Isaurian and his son Constantine Copronymus. He was also the first to write a refutation of Islam. The time he had spent as a counsellor in the courts of the Moslems of Damascus had given him opportunity to learn their teachings at first hand, and he wrote against their errors with a sound understanding of their essence. Saint John was surnamed Chrysorroas ("Golden-stream") because of the eloquence of his rhetorical style and the great abundance of his writings; this name - Chrysorroas was also the name of the river that flows by Damascus. In his writings he set forth the Orthodox Faith with exactness and order. In his old age, after his foster-brother Cosmas had been made Bishop of Maiuma, John also was ordained presbyter by the Patriarch of Jerusalem. Having lived eighty-four years, he reposed in peace in 760. In addition to his theological writings, he adorned the Church of Christ with metrical and prose hymns and composed many of the prosomia used as the models for the melodies of the Church's liturgical chant; he also composed many of the sacred hymns for the feasts of the Lord Saviour and the Theotokos. 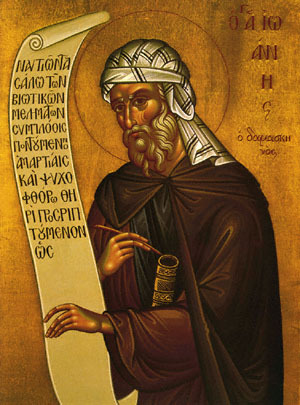 The life of Saint John of Damascus was written by John, Patriarch of Jerusalem. See also June 28. Share the feast of John the Righteous of Damascus with an icon greeting ecard.